Two years ago, in September 2016, I did my first suicide awareness programming at Tishomingo High School with our students. My position with HealthCorps is funded by The Chickasaw Nation. The non-profit focuses their involvement in high schools around the country to three main areas of wellness: nutrition, physical activity, and mental resilience. 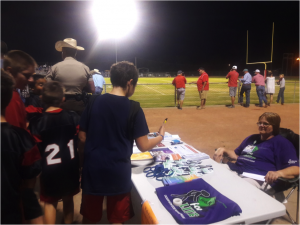 The Johnston County Health and Wellness Committee collaborated with the school to host Friday’s pre-game activities, including equipping fans with local resources. Pictured below, Deanna Carpitche, of The Chickasaw Nation’s Prevention Services, invites fans to Saturday’s Walk for Life, suicide awareness event at the Capitol grounds.